Why do you visit museums and galleries? What is it about a particular exhibit that catches your attention? When you leave the exhibit what sticks with you? After having that experience what happens when you enter your own creative space; is there a shift in your work? As artists we seek art as a way of attaining inspiration. It also gives us something to aspire to on our journey of creation. We create for all different reasons, but part of the outcome is it leaves a legacy. Our work is our narrative. It provides the world with a visual representation of our lives. If you’ve ever done a retrospective of your work you may notice patterns in your work. 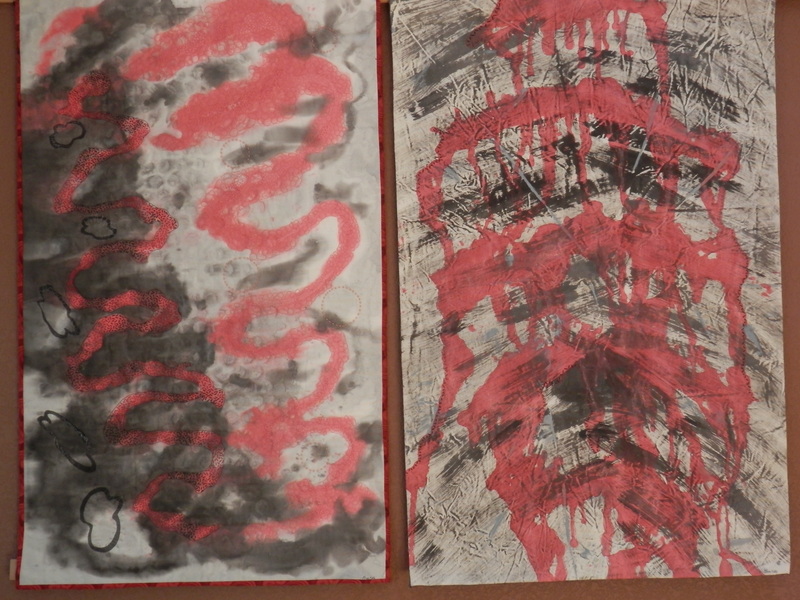 I have two pieces (left: “In Sickness and In Health”, right: “Stop the Madness”) currently hanging in my living room that represents a difficult period in my life. I believe it was a time when I was having a flare of my autoimmune disease. The pieces were in response to my struggle with the discomfort and disappointment I was experiencing. Fortunately I had an outlet and one of the things about art is you can put it in the closet when it doesn’t serve a purpose. I brought these works out this past weekend just to rotate the work hanging in the house. I’ve been looking at it and it reminds me of that difficult time. It also allows me to cherish the positive health outcomes I’ve had since that point. I can reflect on what was and see what is! I also can see how the art mirrored my feelings at the time. It gives me the sense of knowing that telling that story, no matter how difficult, is always available to me. We seek out the work of artists to see how they used technique. When we examine their lives we can see how the work reflects their personal or historic context. Your art has the same kind of impact when others experience it. Your work can make others feel not so lonely in their own journey of health and healing or overcoming any type of adversity. Give yourself a lot of credit for creating awe-inspiring work. It doesn’t have to be in the Metropolitan Museum of Art to have far reaching impact on the lives of others!